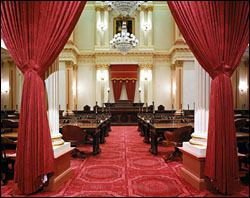 The CHBC’s Advocacy Committee leads the legislative and regulatory efforts, in coordination with the Board of Directors and the Executive Committee, to advance the policy priorities of the hydrogen and fuel cell industry in California. The Committee discusses energy strategies and technology deployment through face-to-face meetings, briefings, written positions, and presentations before agency and legislative staff. To stay updated on the constantly fluctuating policy developments in California, the Advocacy Committee, comprised of Board members, committee chairs, and SAG chairs, meets on a weekly basis. The Advocacy Committee is led by Committee Chair Dr. Jeff Reed, Advanced Power and Energy Program, UC Irvine, Co-Chair Tanya Peacock, Public Policy & Planning Manager, Southern California Gas Company, and Vice Chair La Stanja Baker, Senior Consultant State Government Affairs, Toyota Motor Company. Launch CEC & CPUC & ARB joint hydrogen working group in new administration. Create one page vision of hydrogen for new Governor and legislature. Develop individual Fact Sheets on pending legislation. Leverage Hydrogen Council Announcement 2030 – 100% of renewable hydrogen by 2030 – Could work with state government to achieve this goal.